The Communibears have had two visitors today, welcoming them to Southampton. 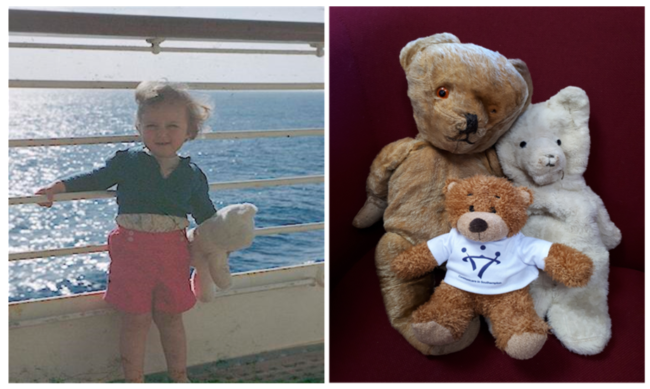 Both aged 60 Ben and Elizabeth were “born” in Southern Rhodesia in August 1958 when each of Annie’s grandparents sent a bear as a first birthday present. They first came to Great Britain in September 1959 when Annie entered the country for the first time, travelling overland by train to Cape Town, then sailing on the Pendennis Castle to land in Southampton. At this stage of her life Annie was completely dependent on Elizabeth for all social interaction outside of the immediate family! Without her polar bear under her arm she was unable to talk to anyone at all. As you can see, both bears are now showing the passage of time and have multiple health issues. However, they are keen to continue to play their part in the community and believe that no one is too old or disabled to lend a helping paw or offer a welcoming smile. Meanwhile the Communibears are settling in well and hoping that they will all find permanent long term homes soon.